A caretaker's cottage was located on the Provo Tabernacle block. 2012 by Intellectual Reserve, Inc.
First came the backhoes in mid-October, scraping off asphalt and modern layers of dirt. Then came the smaller tools — picks and shovels. The excavation took place over the course of three weeks on the site of the old Provo Tabernacle, where work is underway to use the tabernacle's old walls in the construction of the new Provo City Center Temple of The Church of Jesus Christ of Latter-day Saints. 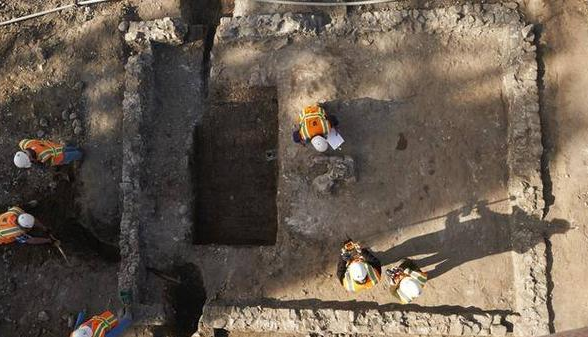 The excavation revealed a remarkably intact picture of one of the earliest baptistries built in Utah. In fact, the Provo baptistry, which was constructed in the 1870s, was the first outside Salt Lake City with the exception of one in St. George. Archeologists knew the baptistry existed from church historical records and fire insurance maps going back more than 100 years. Still, Talbot called the findings "a great surprise." Talbot and his team, which included a dozen BYU students, found not only the baptistry walls, but also the lower walls of the 5-by-9-foot font as well as pipes and the foundation of what they think was a stove used to heat the water. The baptistry provided privacy and a more comfortable, year-round setting for baptisms to take place, according to Talbot. The small building was located near a meetinghouse built around 1860 and the old Provo Tabernacle, which was built in the 1880s. 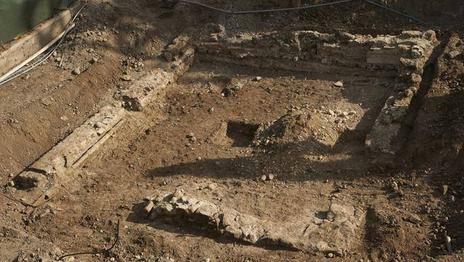 The baptistry's remains were found just to the northwest of where the temple will stand. Church leaders expect the temple to be completed in 2015.